The author of the national bestseller The 500 returns with a pulse-pounding new thriller--the story of two brothers, billions of dollars, and the heist of a lifetime. After escaping the corrupt back rooms of Washington, DC, Mike Ford is again playing a dangerous game--and this time the stakes are even higher. Mike's brother is in over his head in a powerful conspiracy to steal a secret worth billions from the rarely understood, vitally important trading desk at the Federal Reserve Bank of New York. Trying to bail his brother out, Mike quickly finds himself playing a dangerous game, trapped into planning the heist himself, forced to call on all the skills of his criminal past in order to escape. In this sharp, fast-paced sequel to The 500, Mike Ford again stars as the cunning and courageous former con man with a big heart, and Matthew Quirk confirms that he is one of the most exciting thriller writers at work today. A roller coaster of a thriller...The Directive does for the Fed what Alan Drury did for Senate intrigue with his Pulitzer Prize winning Advise and Consent, what Aaron Sorkin did for the White House in The West Wing and, now, what Beau Willimon, is doing for the Congress with House of Cards...Quirk's writings drips with the kind of eye for the telling detail that only a canny reporter, detective, or spy possesses....If you like Ludlum you are certain to like Quirk." 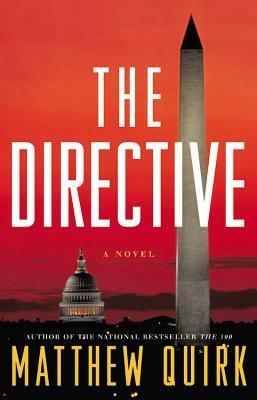 "Solidly researched, with elements of a technothriller, this is a nonstop, heart-pounding ride in which moral blacks and whites turn gray in 'the efficient alignment of power and interests' that is big-time politics. Quirk has another high-powered hit on his hands."